Content: Many creatives experience creative blocks due to the resistance that is part of the creative process. Too often, resistance stops the artist from making movement in their art work or out in their careers. This includes artists with disabilities and without disabilities – no artist is immune to this challenge. However, resistance can be a conduit for change when the artist uses techniques and strategies alongside their art making process. When someone attains a disability or goes through some changes in their lives or artistically this resistance can be stronger than normal. This is where developing a toolbox to handle the many changes that effects one’s creativity becomes highly valuable to the artist. This presentation addresses the many ways in which to redirect one’s creativity. This presentation is for visual artists, musicians, writers, performers, and those that support artists — as well as those who are interested in how creativity works. Over the years I have seen articles and videos about animals like horses, dogs, cats, elephants who could make art. Because my last postings were about animals, I wanted to see what your thoughts were about animals and their ability to make art. The story is about Metro Meteor, a retired race horse who won 8 races and $300,000 in income. The owner is a painter, and he noticed that his horse would bob his head often. So he thought he would have his horse paint. So my question is: Do you think animals can paint, or do we project a human activity onto an animal? 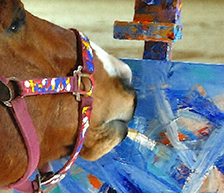 Keep in mind that the horse is making about $500 a painting. Now after me telling you that, does it peak your curiosity? The fact is when art sells, most people put a value on the price. The artwork has been compared to Jackson Pollock’s. This comparison has always been made to amateurs — anything where the lines are expressive and where the artist can’t make form. Then consider how much the owner affects the painting process. Who picks out the colors? How involved is the owner during the process? Then the real question would be how does an animal, specifically a horse, express themselves aesthetically? Is it the same as humans? Humans were interested in animals 13,000 years ago. 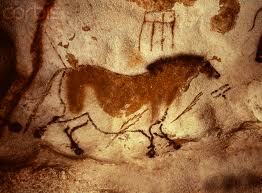 It was evident in this cave painting, (above) painted 13,000 years ago in France. This was a time before written language existed. But it was a time when visual language was evident. The above painting shows a horse in motion. So why did early man paint animals on the wall? Or, perhaps it was an offering to ancestors, spirits, or ancient gods. For whatever reason that animals were depicted 13,000 years ago, animals were an important part of their lives. And today animals are an important part of contemporary life. Maybe for different reasons. How does this artwork affect you? What do you see is going on in this image? And how would you interpret it? I promise by participating you will see more. By writing down your interpretations you will heighten your visual seeing skills. This is one way to develop your sight and your intellect at the same time. Ps. More to come this week about horses and art. Robert Motherwell is considered one of the great American Expressionist painters, right alongside Jackson Pollock, Mark Rothko, and Willem De Kooning. You would wonder how an artist with this stature would say that “Art is an experience, not an object,” because his artwork is all about the object (just look at what $ his paintings are going for). If the experience is more important than the object, then the final product is secondary. From my 25 years of experience as an artist and art teacher, I would say that when a person is in the creative act, this is where everything happens. This is where they gain all the benefits. This is where ideas and personal transformation can happen. The experience is the most pivotal point. And as an artist who is involved in actions for animals, I consider the act of making a difference in animals’ lives comparable to the creative act. It goes into my direct experience of painting or drawing an image of an animal. And it gives me the experience of making a difference. WHO ARE THEY AND WHY SHOULD YOU CARE? …. And what does it have to do with art? You might be wondering why Art and Ideas is writing about an animal shelter in Georgia and what does it have to do with art. Read the below and I will explain the connection. providing food, medical care and companionship for homeless, injured and unwanted animals. founded by Terra Lucent in 2006 located in St. Marys, GA.
Terra noticed the large population of feral cats on the waterfront, and decided to do something about it. Now consider the expense at $100,000 a year for an 8 year period that Terra invested in for Homeless, injured and unwanted animals. Deadline to give financial support is 12pm Friday August 15th. All proceeds go to the animal shelter and the animals. Remember no amount is too small. After 25 years as an artist it has become clear to me that art is not an object but an experience one has. Art is a process in which one has an experience that transcends the person. I know this sounds very abstract, but tomorrow I will follow up and explain more.